In late March, culinary grande dame Alice Waters was awarded France's highest accolade when she was made a Chevalier de la Légion d'Honneur, joining Julia Child as the only American women to ever receive the honor. Mavericks both in and outside the kitchen, Waters and Child are emblematic of pop cooking's first female American wave  native-born, French-focused and Caucasian. Now, in their wake, comes a new tribe of lady toques far more rooted in the Raj than Escoffier. Indeed, from the kitchen to the wine cellar, TVs to PCs, Indian women have quietly emerged as America's newest foodie heavyweights. Led by cookbook author and television host Padma Lakshmi, Indian women chefs, sommeliers, writers and restaurateurs are proving a potent force in the male-dominated world of high-profile cuisine. "Food is entrenched in our culture, in our families, in our history," observes master sommelier Alpana Singh, director of wine and spirits for Chicago-based Lettuce Entertain You restaurant group. "Cooking is not something sudden for us," she adds. "We're just expanding beyond our own community." 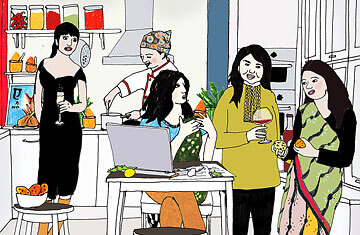 What is new is the stature of South Asian women now embarking on high-profile culinary careers. Gone are the "auntie" archetypes like author Madhur Jaffrey, cooking comfort curries for the masses. In their place are globally minded pros like Singh  the youngest-ever woman to be named a master sommelier  along with chef Maneet Chauhan, who trained at the venerable Culinary Institute of America and both the Taj and Oberoi hotel groups before heading the kitchens at the Vermillion restaurants in New York City and Chicago. There's Vermillion owner Rohini Dey herself  a World Bank and McKinsey vet. And there's Divya Gugnani, a former Goldman Sachser helming foodie website Behind the Burner, which publishes restaurant ratings, celeb-chef tips, nutrition news and product reviews. Behind the Burner segments also air on NBC's New York Nonstop channel, reaching 5.7 million homes in the New York area. "My mother demanded I have an education, a career," says Gugnani, who has both an MBA from Harvard and professional chef training from New York City's French Culinary Institute, "but I always just wanted to be in the kitchen." All of these women bring an extreme sense of achievement to their endeavors  careers often at odds with conventional Indian expectations of family and tradition. "There's close to negative respectability for entrepreneurship like this in our culture," concedes Vermillion's Dey, who earned a management-science Ph.D. from the University of Texas. "People wonder, Why give up a proper career to run a restaurant?" One look at Manhattan's year-old At Vermillion and it's easy to see why. Sprawling over 1,100 square meters, Dey's duplex, light-drenched domain showcases chef Chauhan's unusual Latin-Asian cuisine. Chauhan's plantain chips with tandoori skirt steak  a dietary no-go for cattle-venerating Hindus  may be an example of only-in-America fusion folly, but dishes such as duck vindaloo arepa and chili-glazed blackened tamarind ribs betray the similarities (tropical fruits, pungent spices, hearth-baked breads) of both culinary traditions and are extremely successful. So are her Mexican huitlacoche and Peruvian quinoa served with Sri Lanka sambals and Goan curries. "From the Mughals to the Moors" is how Dey describes it. Underlying it all is Chauhan's rigorous training paired with near encyclopedic knowledge of her homeland's techniques. This is the essence of the Indian culinary edge, says Lakshmi. "A comprehensive knowledge of Indian cooking ... helps you when delving into cuisines," she explains, "because of the necessary mastery of spices and ingredients." And so it is that more than half a century after Julia Child first arrived in her own Parisian kitchen, American women of South Asian origin are continuing her tradition of curiosity and creativity. In doing so, they are charting a professional path not just for their own subcontinental sisters but also for food-focused women of all cultures and traditions. "This wave isn't just limited to Indians," says Lakshmi, easily the world's most famous Indian female foodie. "The culinary landscape is [finally] opening up to women in general." In a hidebound culinary world long dominated by men, change is coming at last. See 50 authentic American experiences.